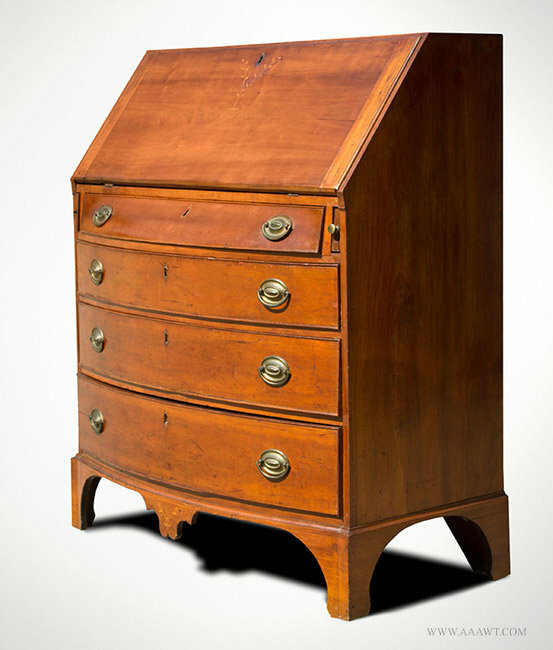 Projecting elliptical top having a pair of short drawers above recessed lower case; pair of elliptical doors flanked by concave panels adjacent to block-styles forming case ends and continuing to double-tapered legs. 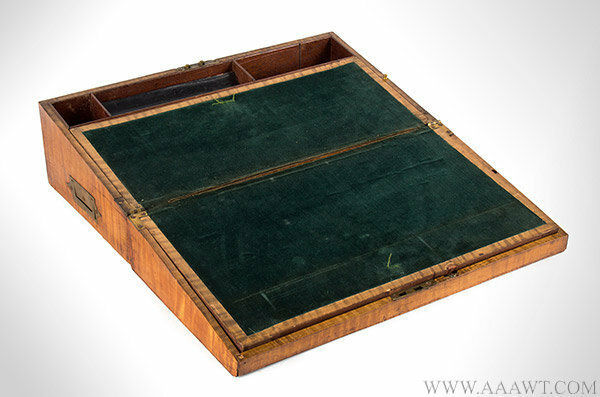 The case with rectangular hinged lid featuring a leather vapor barrier affixed with brass upholstery tacks…all within an applied molded edge, the interior fitted with a series of seven valanced pigeonholes above three short-drawers, one with scrimshaw escutcheon and original lock. 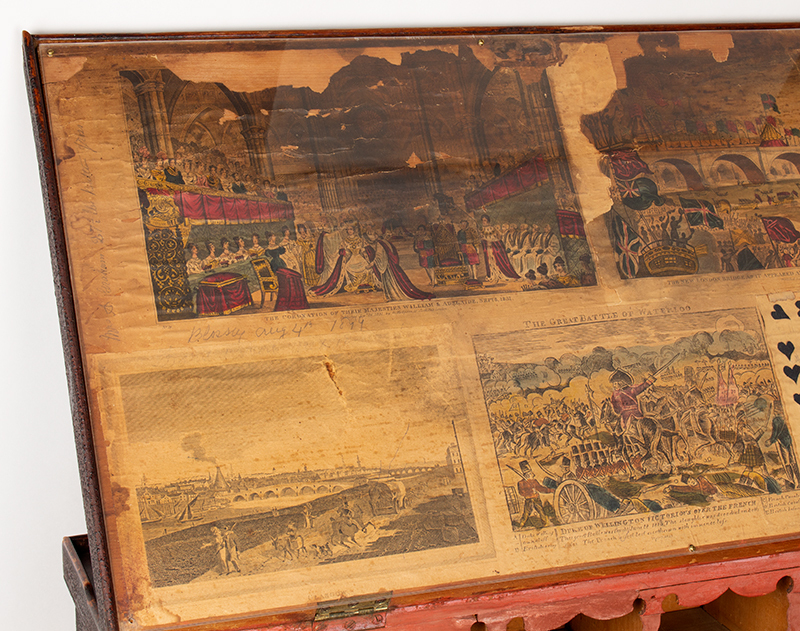 The inside of the lid affixed with engravings depicting “THE GREAT BATTLE OF WATERLOO,” “THE NEW LONDON BRIDGE AS IT APPEARED AT THE OPENING BY HIS MAJESTY WILLIAM 4TH AUGT 1 1831,” “THE CORONATION OF THEIR MAJESTIES WILLIAM & ADELAIDE SEPT 8 1831,” a battle scene and a painted roundel surrounded by a border of cut-out hearts, inlaid on the front with a diamond escutcheon above a heart flanked by stars, over a molded serpentine and scroll-shaped base. 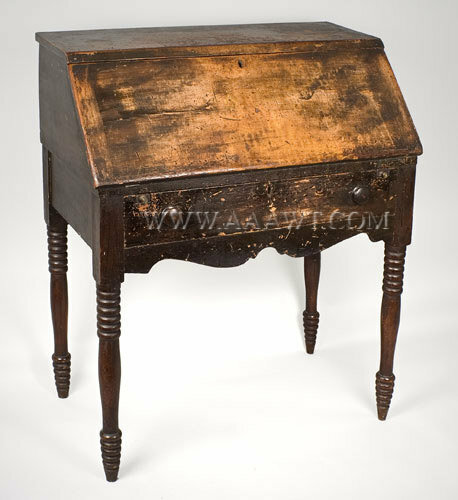 (A great looking desk in surface, minor imperfections consistent with age and use; wear to a couple lobes, ending-out to one foot; secondary cleat/shoe and both secondary feet on right side are replaced…NOT the actual foot and skirt. 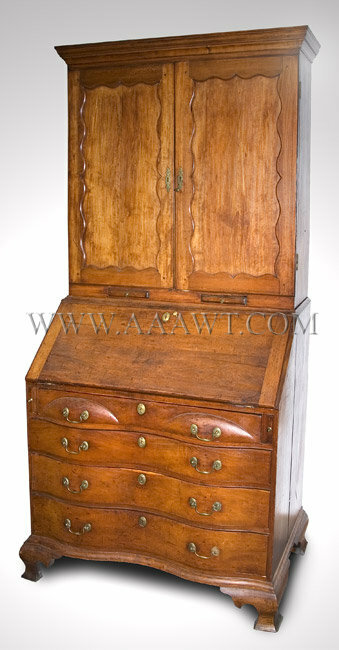 Stepped interior featuring fan-carved central drawer flanked by document drawers and valanced compartments above short drawers on a case of four graduated long drawers having thumb-molded overhanging drawers. The case, on a molded base, stands on beautifully shaped bandy [cabriole] legs featuring pad feet centering a shaped pendant. 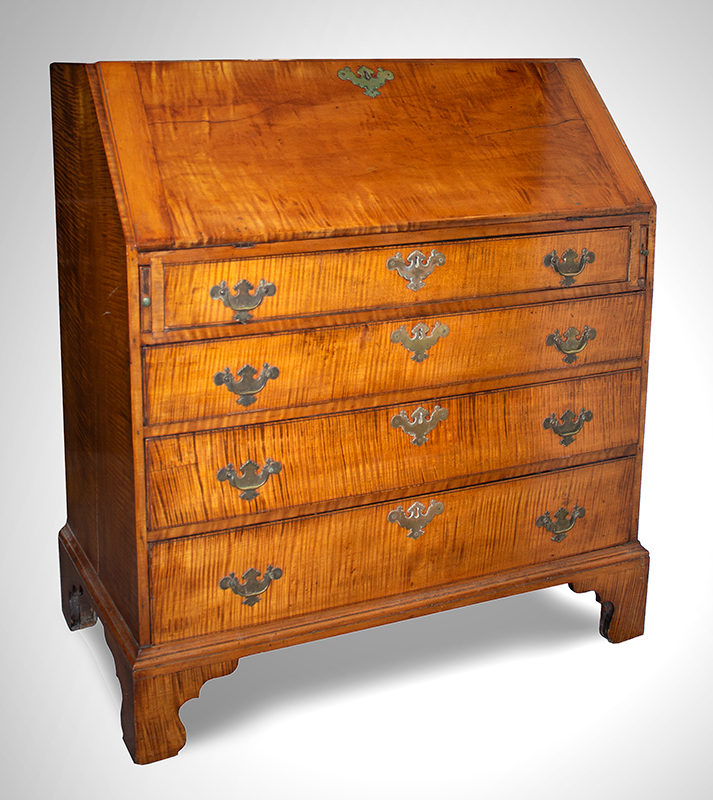 In generally excellent condition with minor imperfections commensurate with age and use; left proper rear return is missing yet easily replaced by our expert…brasses are appropriate replacements. Likely New Hampshire, school of Peter Bartlett (1788-1838), Salisbury, New Hampshire. 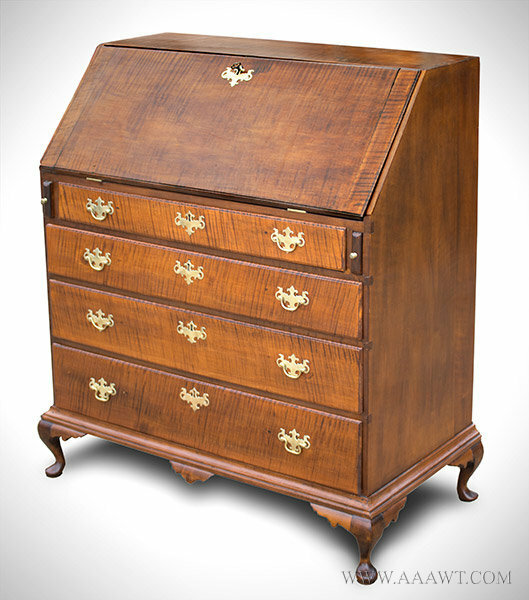 The lid opening to an interior of valanced cubbies over drawers above a case of four graduated long drawers raised on a molded base having a lobed central drop; the shaped and tall bracket feet feature conforming lobes and returns. 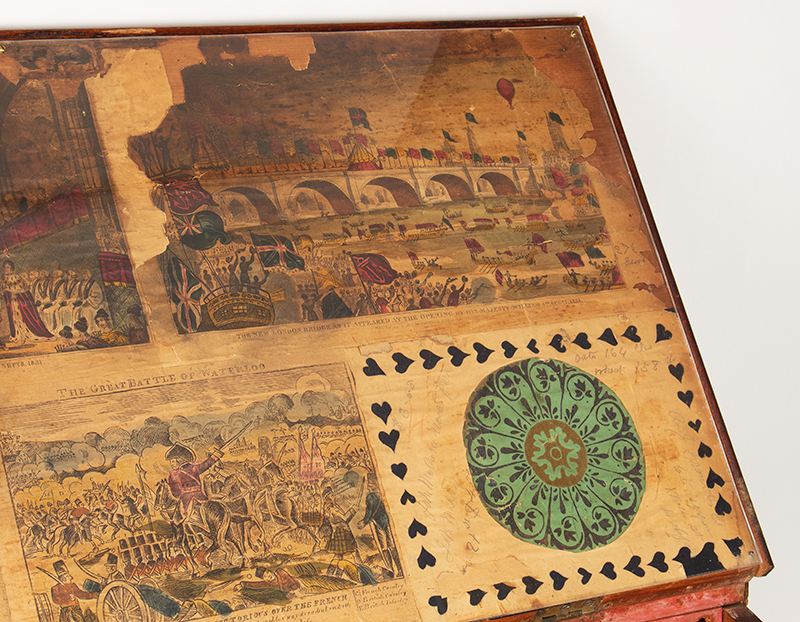 Traces of original color, two glue-blocks replaced, else consistent with age and use. The fall-front opens to reveal a rare and outstanding interior. 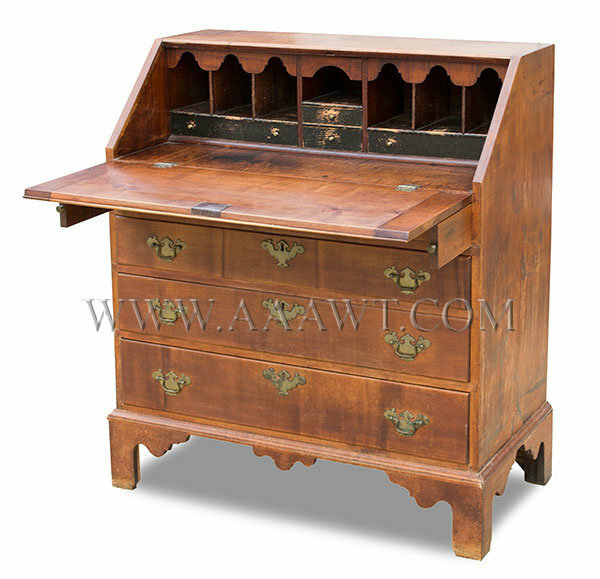 At the center are pilaster document drawers featuring fluted and tapering vertical columns on bases over conforming pen-drawers flanking a large concave drawer over two similarly carved/shaped drawers. 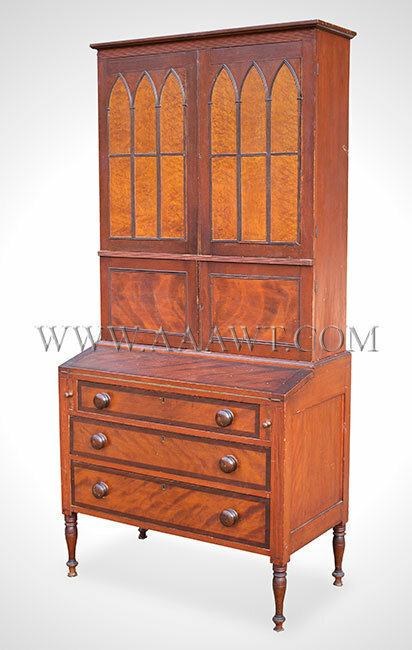 Four cubbies with shaped dividers featuring blocked valances are above a pair of scalloped/blocked drawers resting on projecting single drawer twice the width of the previously described drawer…each side of the deep concave center section. 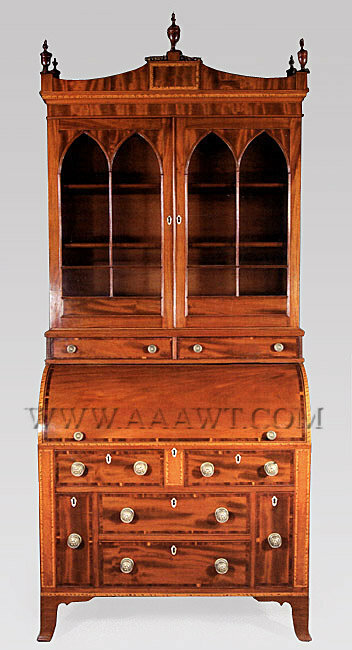 To view a closely related interior please refer to Connecticut Furniture – Seventeenth and Eighteenth Centuries, Wadsworth Athenium, 1967; page 75, object 167; a secretary displaying a less sophisticated although very similar interior from the Norwich Area. 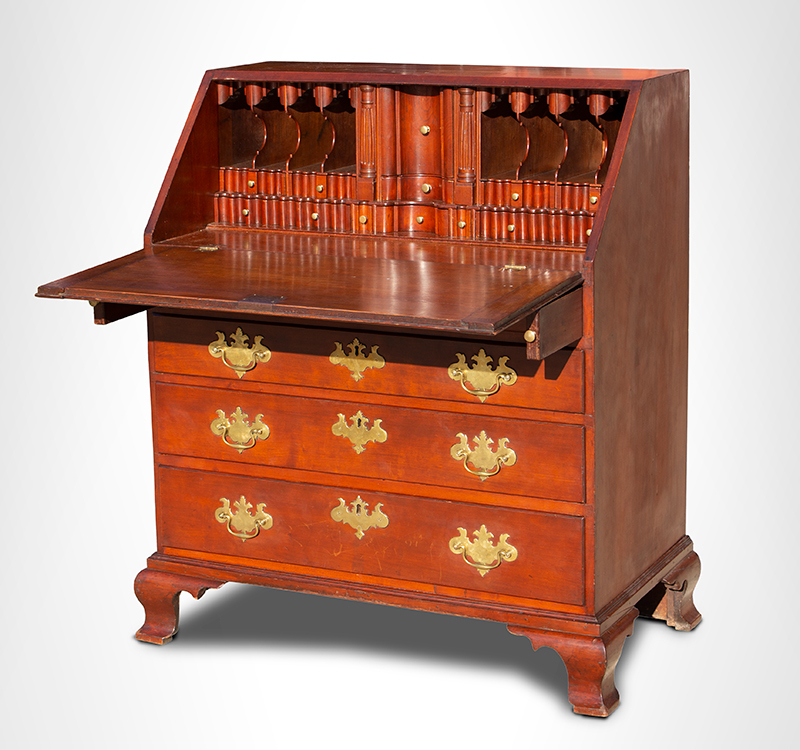 Also, page 38 of Contributions to Connecticut Cabinet Making by Houghton Bulkeley, a cherry secretary with a history of Norwich ownership courtesy of Winterthur. Fall-front lid over four graduated, scratch-beaded drawers on molded base resting on bracket feet. 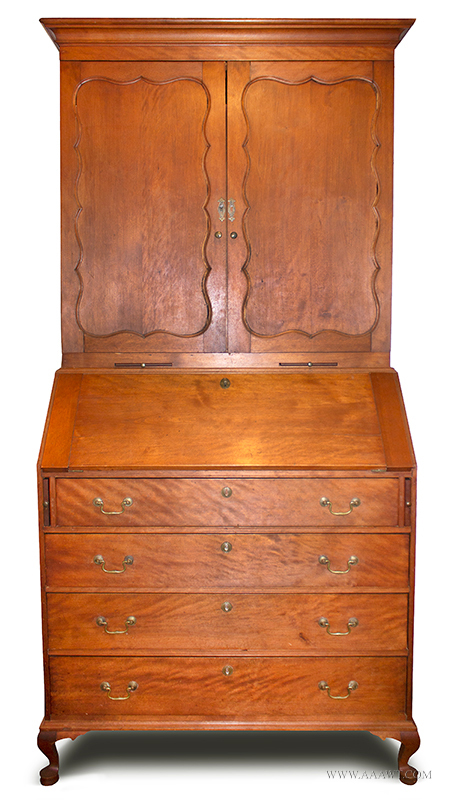 The interior features drawers over valanced cubbies. 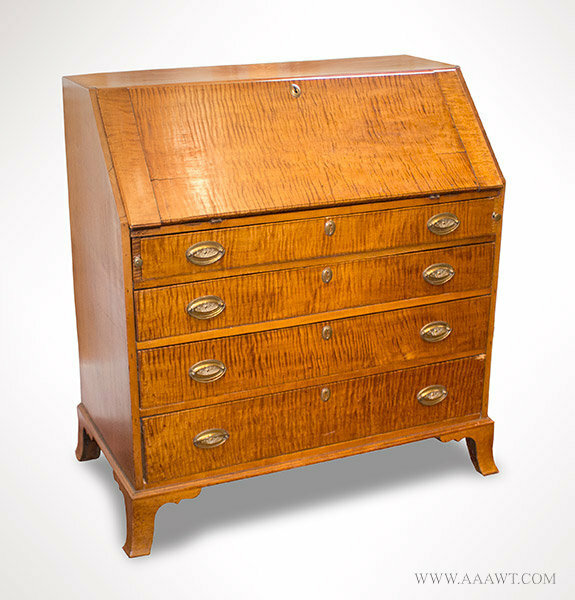 (Old replaced brasses; Height: 43"; writing height: 33.25"; width: 39"; depth: 20.5"
This attractive southern Bristol County desk is constructed of dynamically figured curly maple throughout. 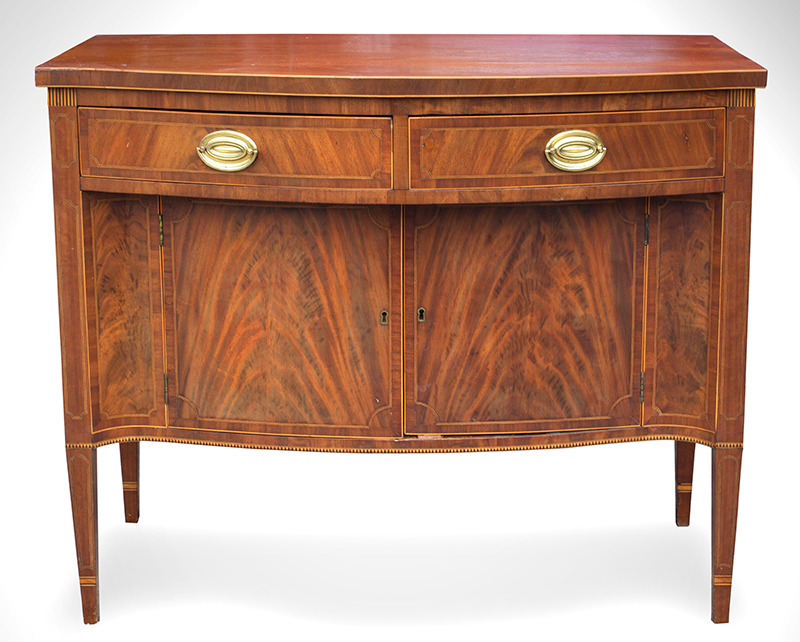 The fitted interior features three-banks of vigorously grained sycamore faced drawers. 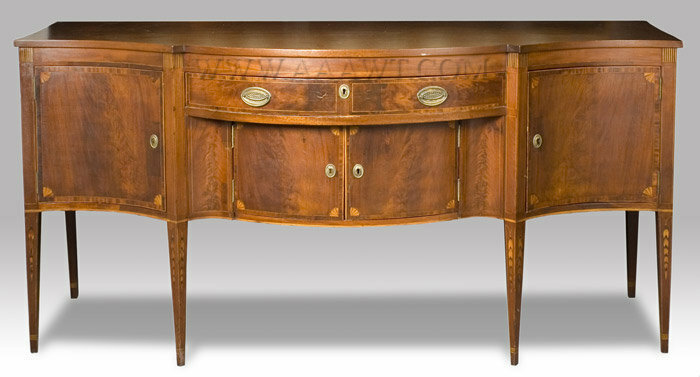 Sycamore is commonly found in south coastal Massachusetts furniture and its use is a strong regional characteristic. 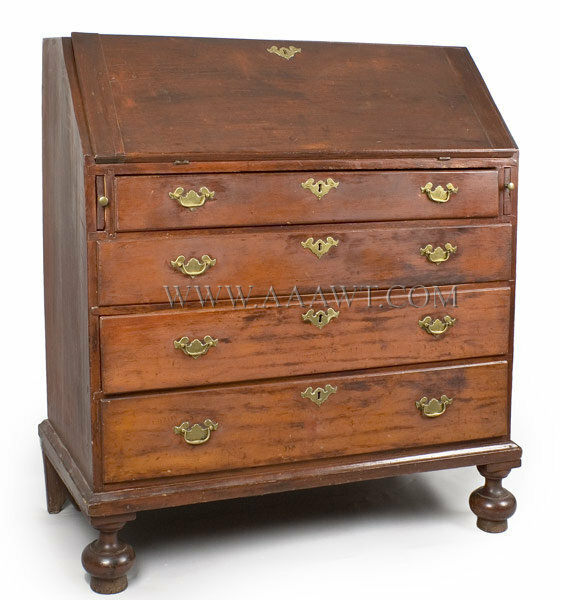 The four graduated thumb-molded drawers are mounted with period brasses within the original borings, and pressed brass lock escutcheons. 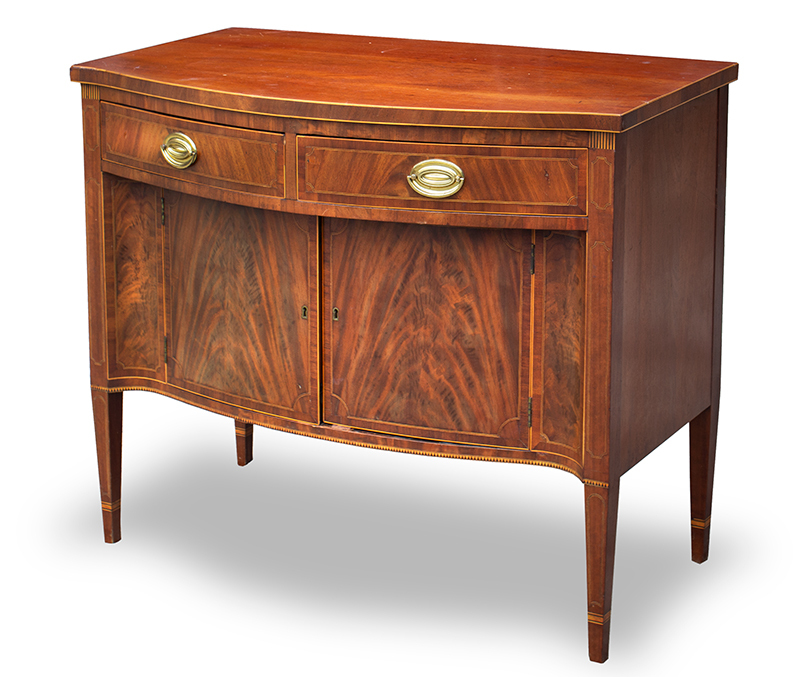 The case rests on beautiful ogee bracket feet stylistically inspired by nearby Rhode Island shop traditions. 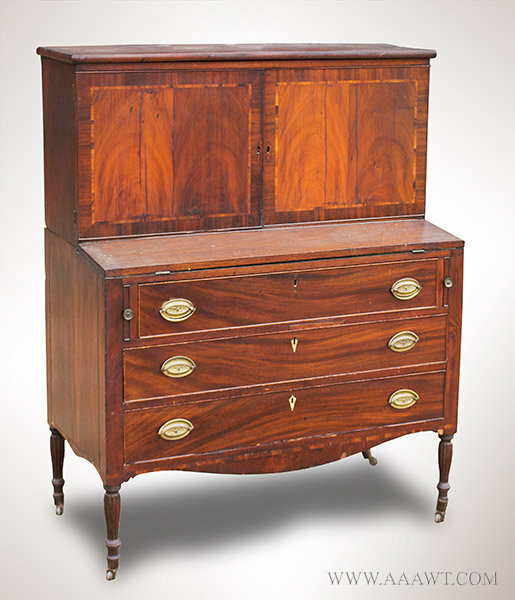 It should be noted that although the feet resemble those favored in Providence and Newport, they speak volumes; note the regions style and flair with their bold returns and platform base. 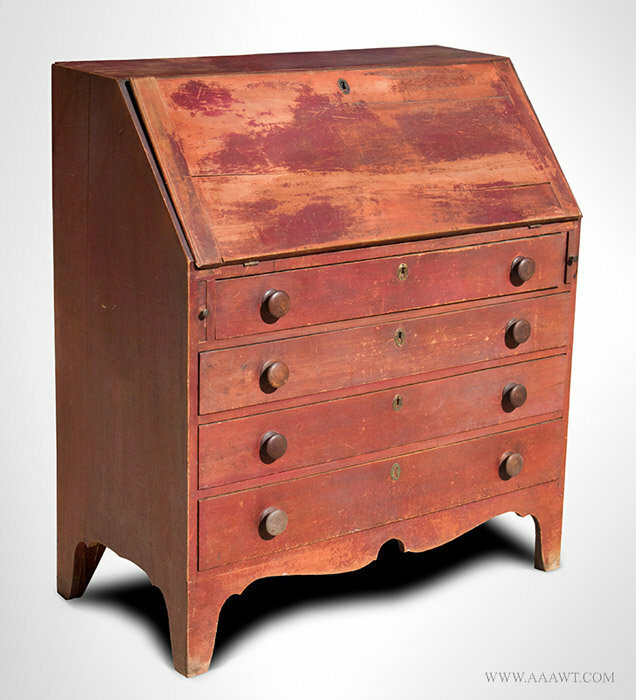 The desk retains a rich old historic surface with a mellow patina that may be original. 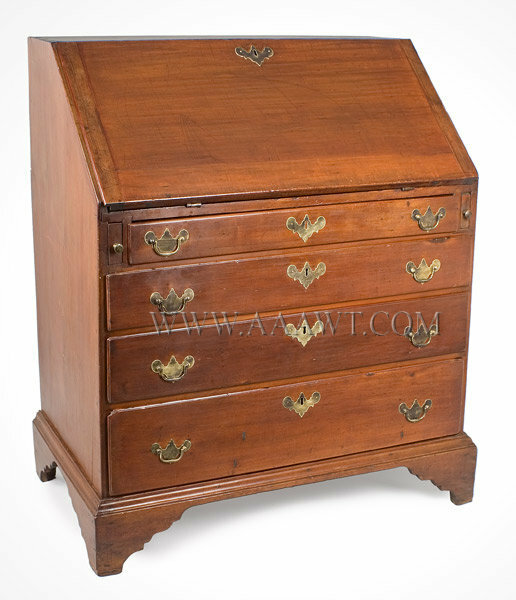 This desk remains in a very high state of originality; brasses are period replacements. 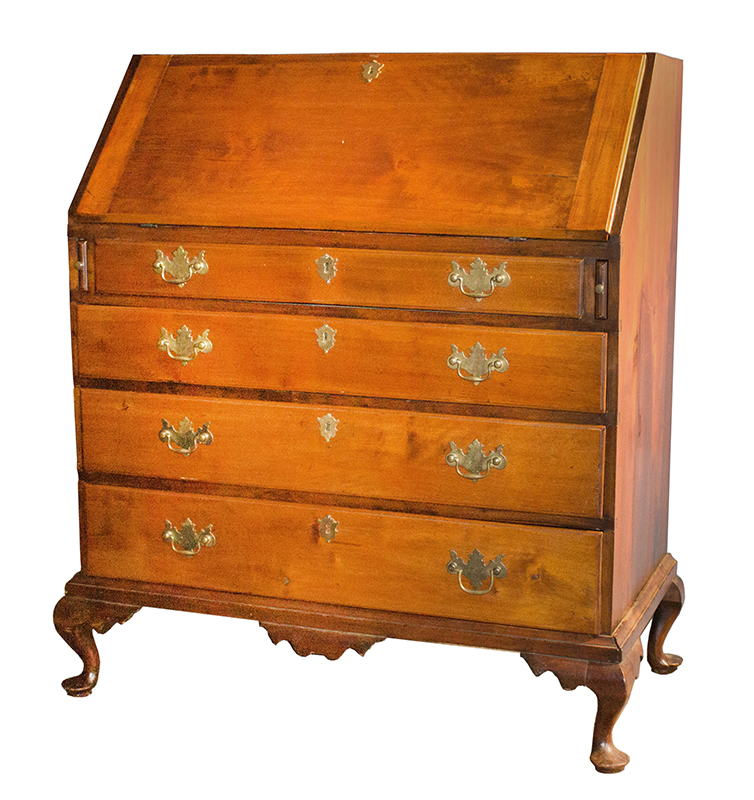 We note that the brasses have been changed since the desk was photographed for book publication. We have the oval brasses as seen in book and will make them available if preferred by new owner. 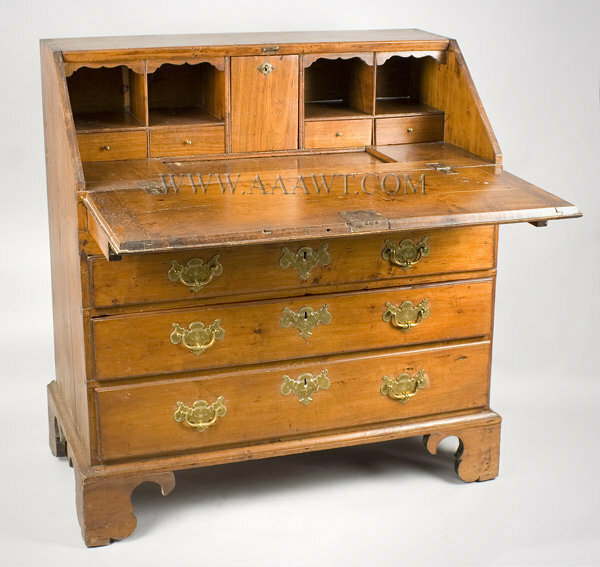 The desk was acquired in the 1970’s from a home directly across the street from the Westport Fire Department and is illustrated in, “Harbor & Home; Furniture of Southeastern Massachusetts 1710-1850”, Page 209, plate 71.2. It was also exhibited in the show relating to the volume, at Winterthur, Spring 2009. 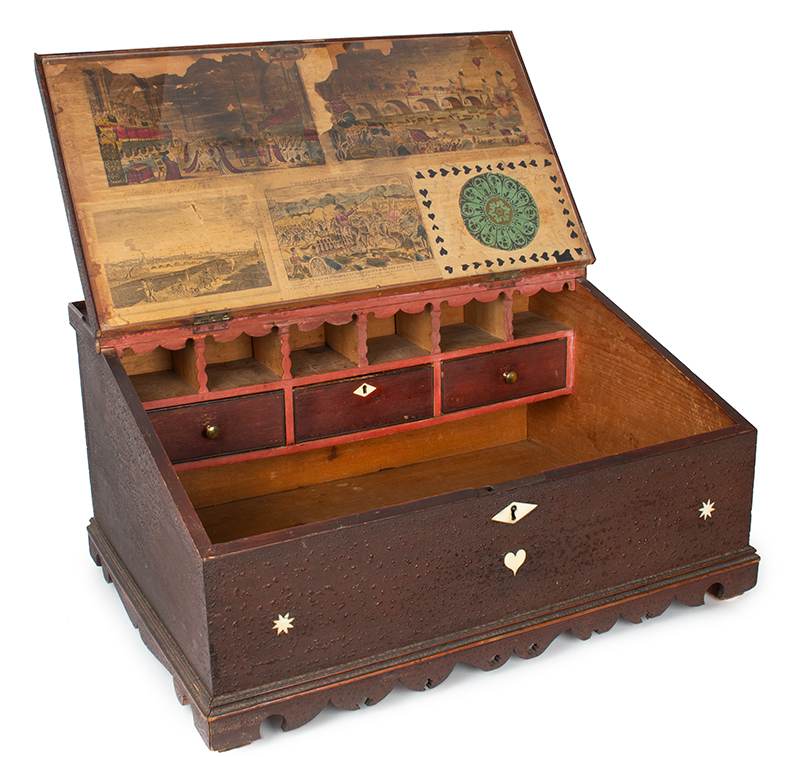 Slightly projecting top over a pair of cross-banded and inlaid doors opening to interior fitted to accommodate ledgers flanked by valanced cubby compartments and drawers. 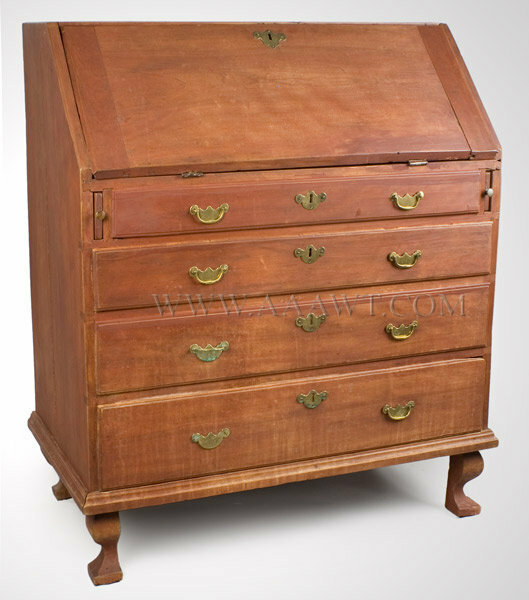 The top section over fold-out writing section and three long drawers; the whole on ring-turned and reeded legs joined by valanced apron banded with inlay. 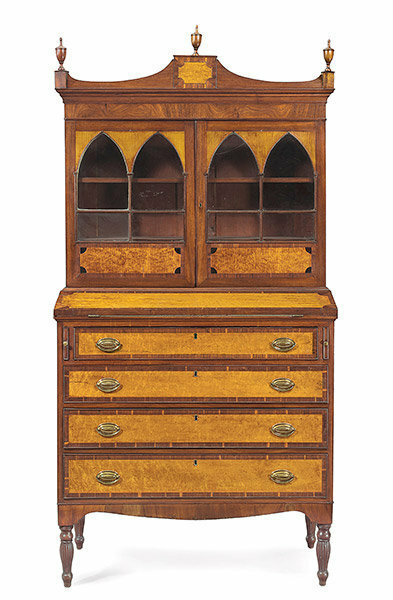 The fall front opens to reveal the interior prospect section with four drawers on each side centering four-cubbies above a leger/open section. 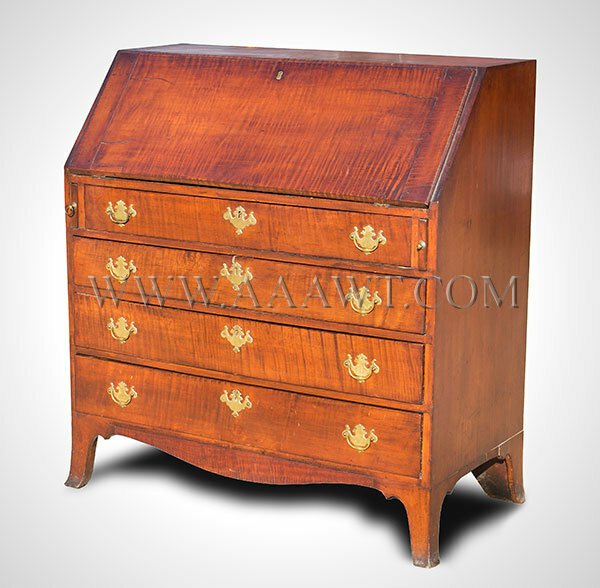 The case with four graduated drawers is raised on French feet joined by valanced apron. 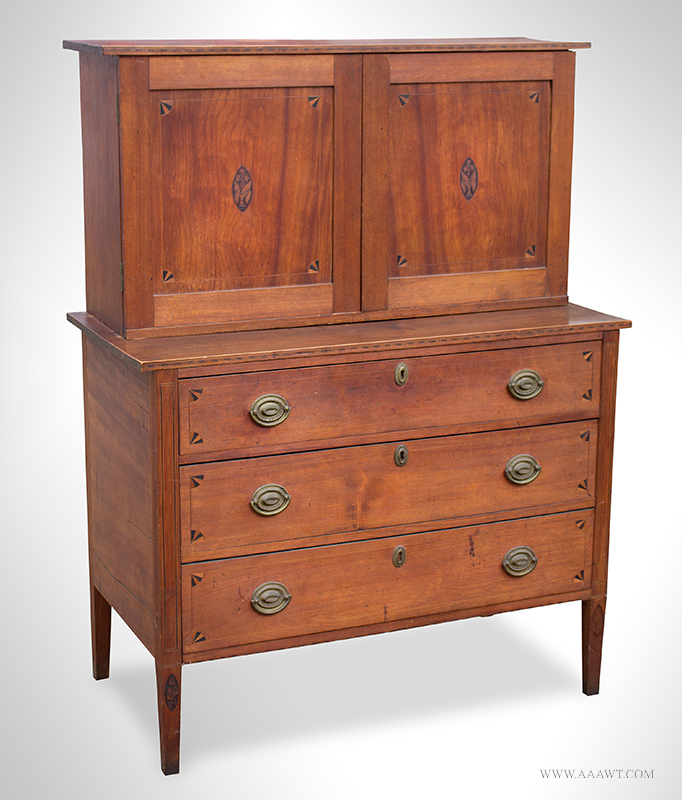 The central drawer above two hinged doors and flanking doors, the doors with quarter-fan inlay, the legs with bellflower inlay, old refinish. 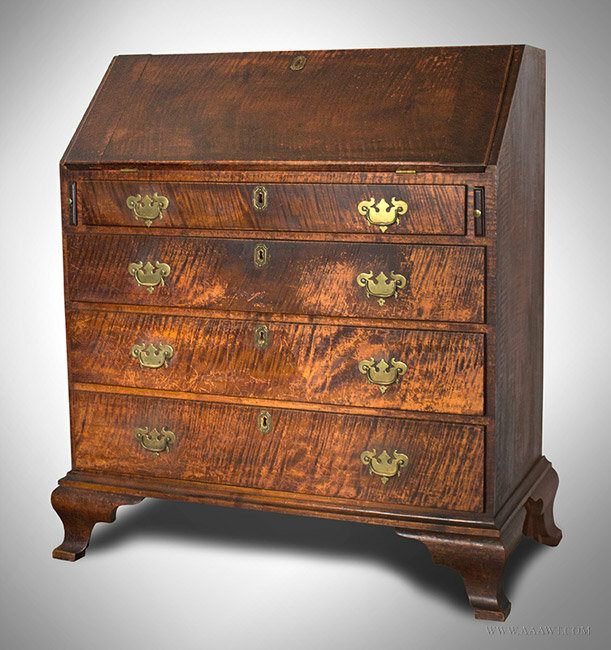 A reasonably priced, ready to use "board" with minor imperfections; patches to veneer on both flanking doors and on center left door near escutcheons, patches near hinges adjacent to center left door, lock mechanism on central drawer broken. 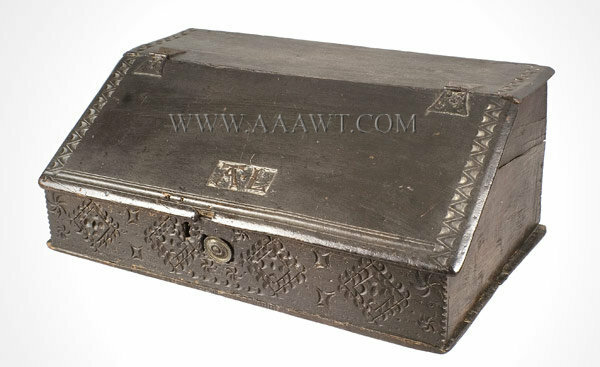 The overhanging molded sloping lid retaining original forged butterfly hinges is carved with initials "AL" and opens to a plain interior; the top and sides of lid are ornamented with V-gouge carving. 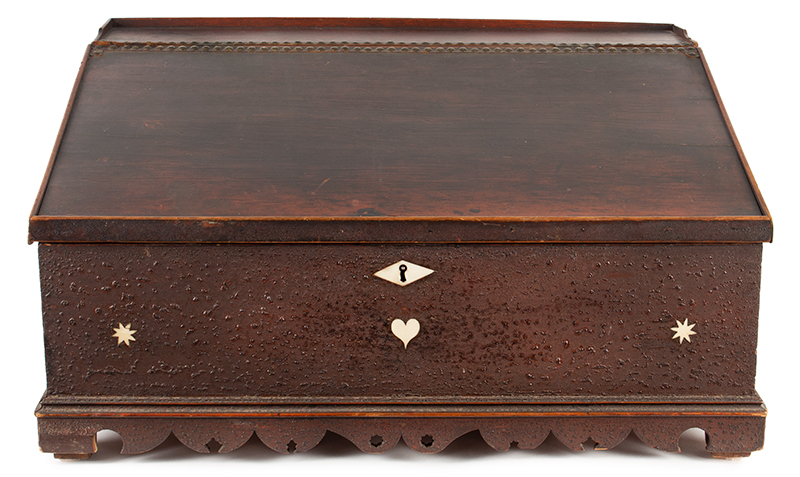 The case is raised on projecting base; front panel of case features carved ornamentation within chip carved outside edges. Minor imperfections consistent with use; latch and lock are missing; early 19th century oval brass plate masks the lock-plate piercing. As depicted, the falling-front with batten ends rests on lopers; the interior fitted with shelf above valenced ledger compartment, centered by a pair of cubbies either side. 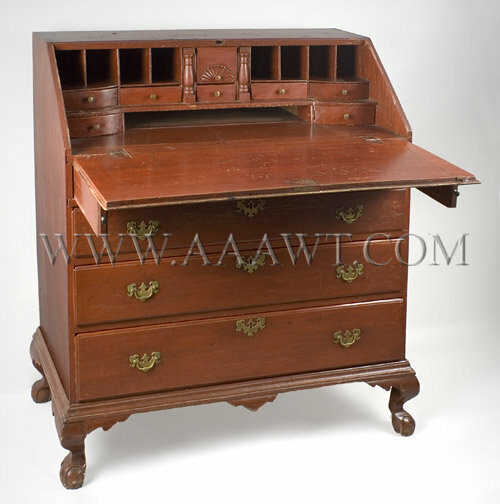 The desk section rests on apron with single long drawer above shaped skirt; the case raised on turned legs. 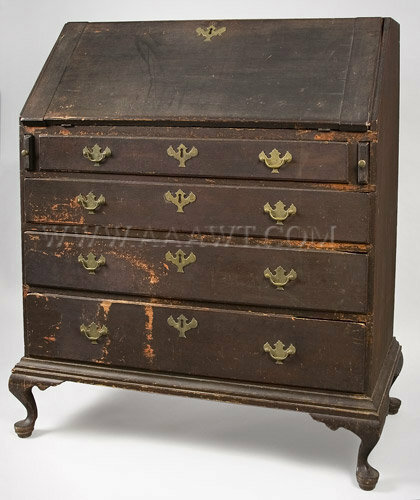 The interior of this desk has the best dry blue surface on each of the scalloped cut outs over each of the four blue drawers. Dimensions: 38.5" wide by 15.5" tall by 20.5" deep. The fall front opens to expose a simple interior featuring a sliding lid above a storage compartment; three thumb-molded drawers; the whole raised on a molded and applied bracket base. 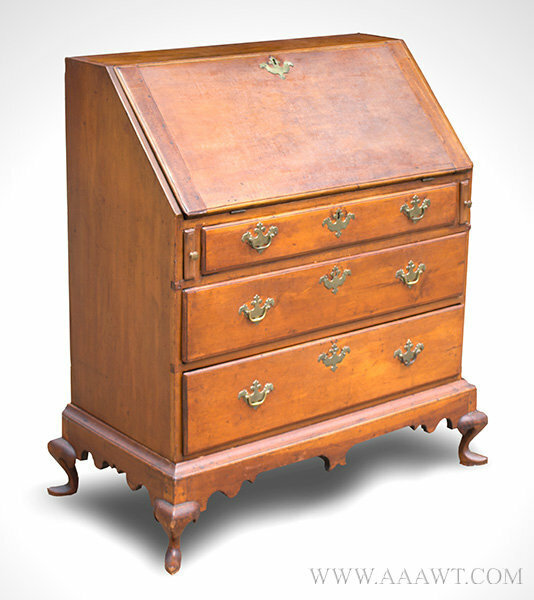 Old refinish, minor imperfections; H: 37; writing H: 27"; W: 34.75"; D: 16.5". 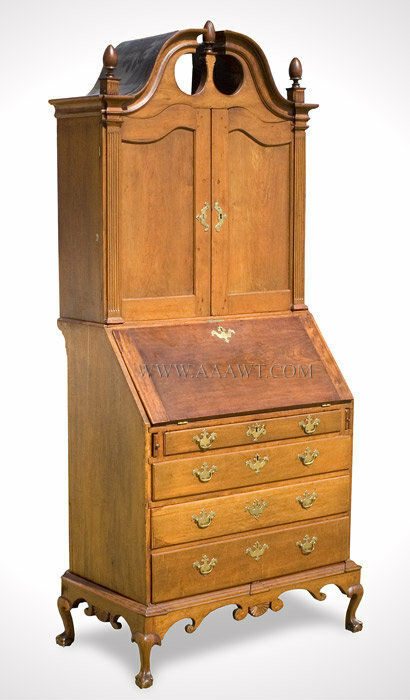 The rectangular lift-top, slant-lid with applied molding opens to reveal a fitted compartment featuring six cubbies above a single drawer centered by two pigeon holes either side; above a pair of ledger compartments. 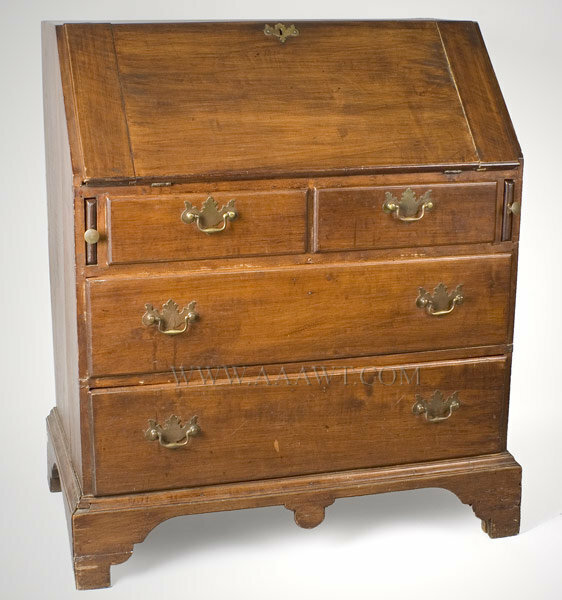 The writing surface is above three working drawers of dovetail construction that retain original turned wood pulls; the whole raised on tall ogee-cutout-feet. 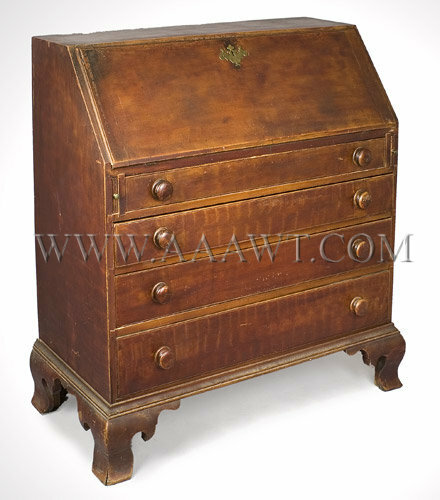 The original faux grained surface remains in fine condition and has developed a nice patina. 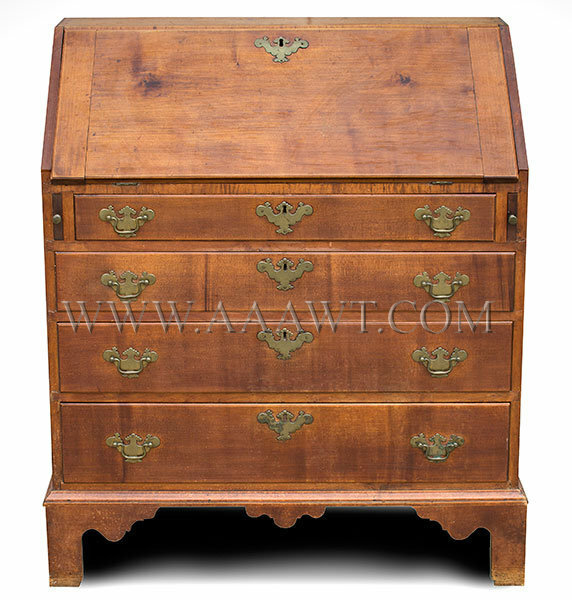 Finely dovetail and mortise/tenon constructed; high shaped galley above slant-lid wring surface with applied molding; the upper case containing cubbies sits within the molded lower case, each side with working long drawer; kneehole with paneled door opening to storage compartment. 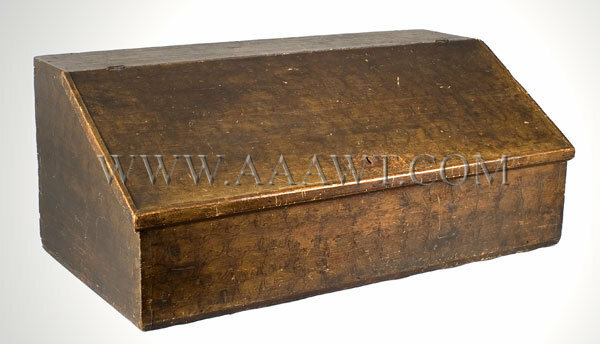 The case with solid paneled sides raised on square legs. Wonderful blue paint over original red. 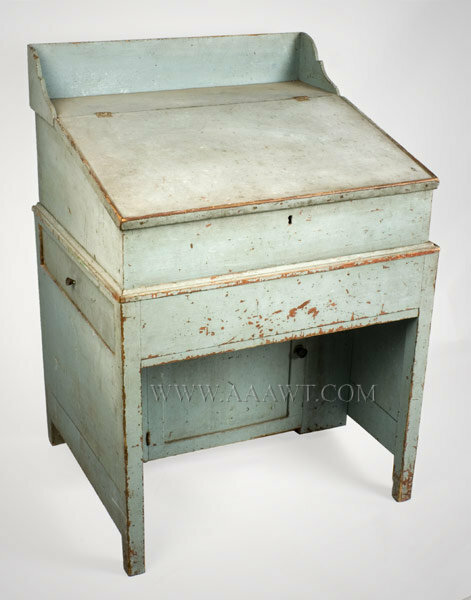 Dimensions: 38" H; 26.25" W; 23.25" D.
Within the shop traditions of "the Bartlett Circle"
The thumb-molded lid opens to rest on original lopers; simple interior of 10-valenced cubbies and two sliding vertical letter-document drawers having turned and split column applied moldings; above five small drawers sliding on a double beaded divider above two longer drawers centering an open space provided for a ledger or other large book. 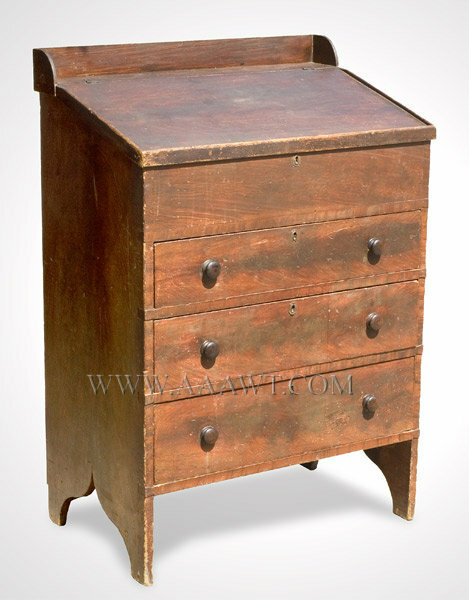 The slant lid remains on original iron hinges that have never been disturbed. 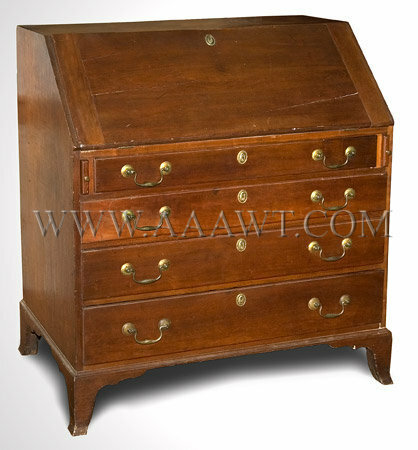 The case with four long thumb-molded graduated drawers on a molded base with bandy cabriole legs on distinctive well defined feet with pronounced rear hocks and large pads. 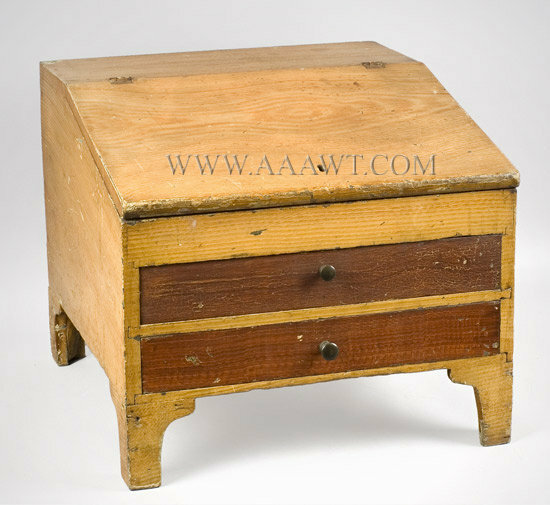 Hocked feet are rare in American furniture; the heel above the ankle has been chamfered leaving a small hock behind the ankle. 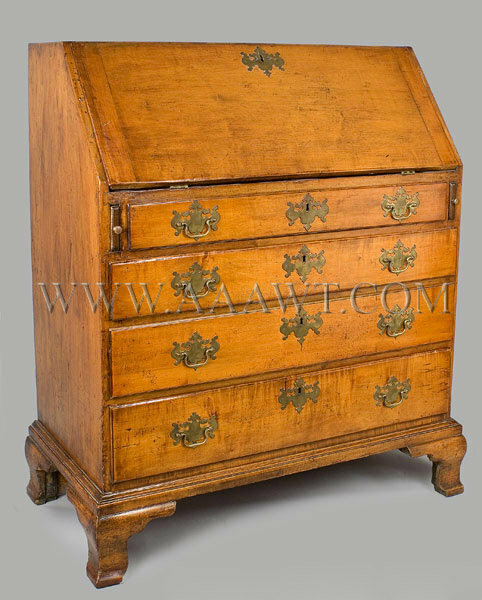 This choice desk of compact proportion measures 36.5" W by 17" D by 42.5" H. This survivor remains in superb "as found" condition. 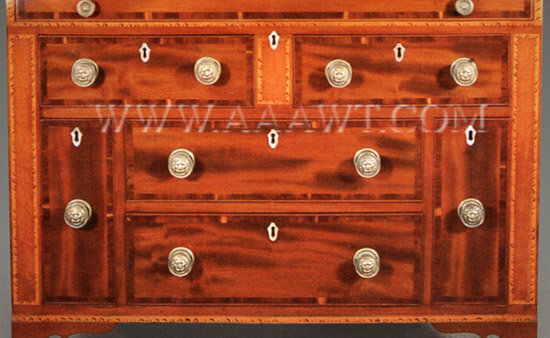 See, New Hampshire's Enduring Queen Anne Furniture: 1760-1825, From the Bartlett Perspective by Walter A. Backofen. 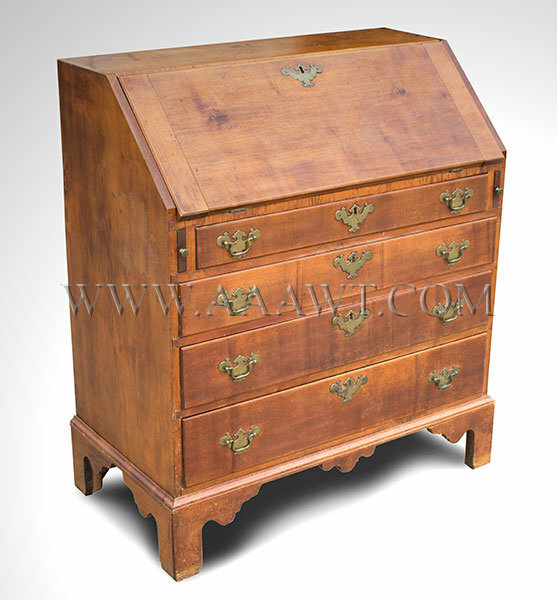 The dovetailed rectangular case with hinged sloping lid opens to reveal a simple interior featuring three cubbies over single drawers on each side of three stacked small drawers at the center.